I thought you’d also love this 273 sq. ft. tiny apartment that this small family lives in in Warsaw, Poland. Even though it’s a tiny space the furniture and design really makes the most of it and it actually looks and feels quite spacious for its size. The big box functions as a bed and storage. Even the staircase that leads you up to the bed has drawers built in so it’s easy to get up there (even for the dog) and it makes the best use of space possible. More photos and info available here. Interior design by UtopiaStudio.pl. Photographer Gosia Góra. Help us spread the word on this amazing tiny apartment with a “Like” below then share your favorite part about it in the comments area at the bottom. If you enjoyed this 273 sq. 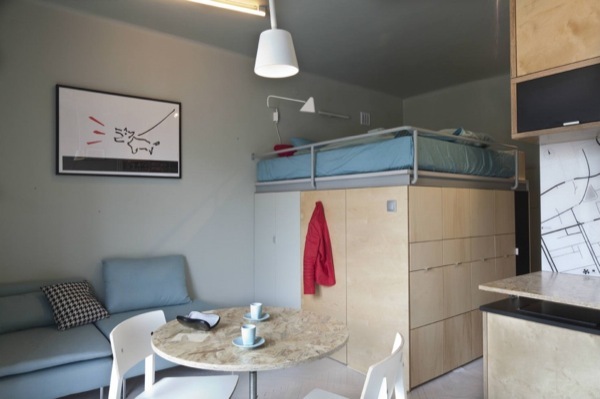 ft. multifunctional apartment you’ll love our free daily tiny house newsletter! Where and on what are meals prepared on- stove top, microwave? Do the Mom and daughter share the bed? Does mom sleep on the couch? I also would have liked to have seen the configuration of all the storage under the bed in the cube. Great questions, Nancy. I thought the same thing about the sleeping arrangement. Seems to me like this is only a short term solution. When she grows up they’ll need more space. That’s why I always recommend for families to just go a little bigger. Otherwise they’ll have to look for another home in a few years which is stressful. As a mom who raised eight kids (there are 21 years from the oldest to the youngest) in what many considered small spaces,I have learned the necessity of multi-purposed areas/items and would have liked to seen how practical this solution would be for long term. Small/tiny homes are relative to the number in the family and their needs. For myself, my youngest four adult children and I continue to share a home. When you take into account differing people’s working schedules (one starts at 6am and one gets off at 6am, I commute 110 miles per day, three days a week and put in 10 hour days at multiple offices and the rest of the time I work out of my home office, plus I am building my own custom sewing business), I don’t think we do too bad with a double wide mobile home. Thanks so much for the differing homes you find and post- I always like finding new ideas. a two-burner cooktop is under the “lid”next to the sink. Where the heck is the ladder leading to? Looks like a solid ceiling to me.